Dulari Ji Is Gone; Unwept, Unheard , Unsung ! 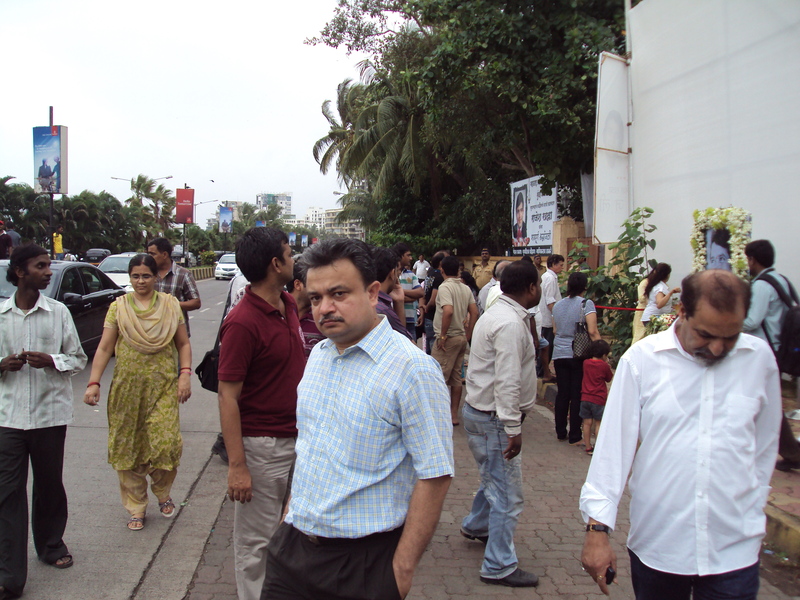 MUMBAI – MAHARASHTRA – INDIA JULY 24 , 2012 07.30 P.M.
As I have stated in my Manali Travel Diary , I took morning flight from Mumbai for Chandigarh on March 18 , 2012 and reached there around 10.00 A.M. 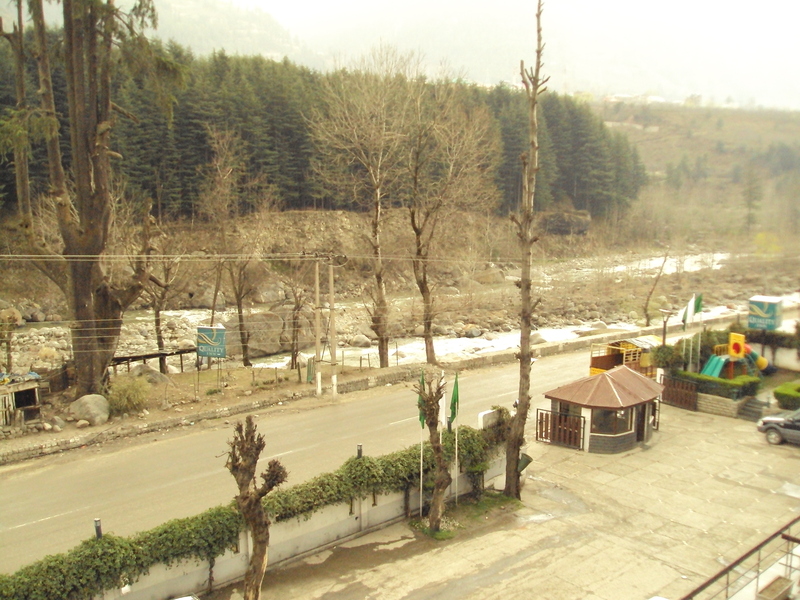 I was given a car by the production people and after 11 hour-long road journey I reached Manali at 10.00 P.M. in the night . My car stopped in the compound of Quality Inn River Country Resort . It was dark so I could not see much . But illuminated exterior of the hotel looked very impressive . It was huge and well maintained . I clicked this photo next morning . When I entered in the lobby , I found that the lobby is cosy and warm and the reception area quite spacious . I was ushered into my room on the 3rd floor . Quite spacious room with 2 separate beds greeted me . I have the problem with joint double – bed . So I was happy to see two separate single beds . 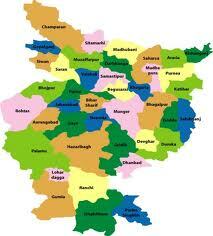 Bed – sheets and pillow – covers are another area of concern . Here they were spotless white , clean and well – ironed . Since it was quite cold and windy outside , so heater was on . After entering a hotel room and after bed , bed – sheet and pillow – covers , I next look for the study table and sockets for charging my mobiles and laptop . I found a pretty big study table placed diagonally opposite the bed . It had a table lamp and a switch – board nearby with multiple sockets . Switch – boards , in some hotels , are very neglected things these days , though they are most essential . In some hotel rooms they are not placed properly . Either they are beneath the study or side tables or they are fitted somewhere near the floor . And you have to go through all the inconvenience to plug-in your electronic gadgets . Here in Quality Inn River Country Resort switch board was nicely fitted near the corner of the top of the study table . I heaved a sigh of relief . Bath – room was well – lit and quite big and all the sections ; commode , wash – basin and bathing closet were evenly separated and were roomy . Surprisingly cupboard was just in front of the bathroom . After having shower , you have to just step out and can lay your hands on your clothes . Side tables near the bed were big enough to accommodate your wrist watch , mobiles , magazines , reading glasses and medicines . Again a welcome change . Dinning hall of the hotel was located on the first floor . Breakfast and dinner was included in the tariff and I realized that in a way it not very costly hotel , though it is a 3 Star property . Dinner was a sumptuous affair and since it was buffet , you have choices also . After dinner , I came to my room and crashed . In the morning , when I woke up and opened the front window , I was ecstatic . Fresh , cold and hilly winds caressed me , played with my body for a while and overwhelmed me completely. I could see pine , deodar trees trembling in the wind and river Bias flowing magnificently in front of me . I have rarely seen anywhere a river flowing adjacent to the main road . 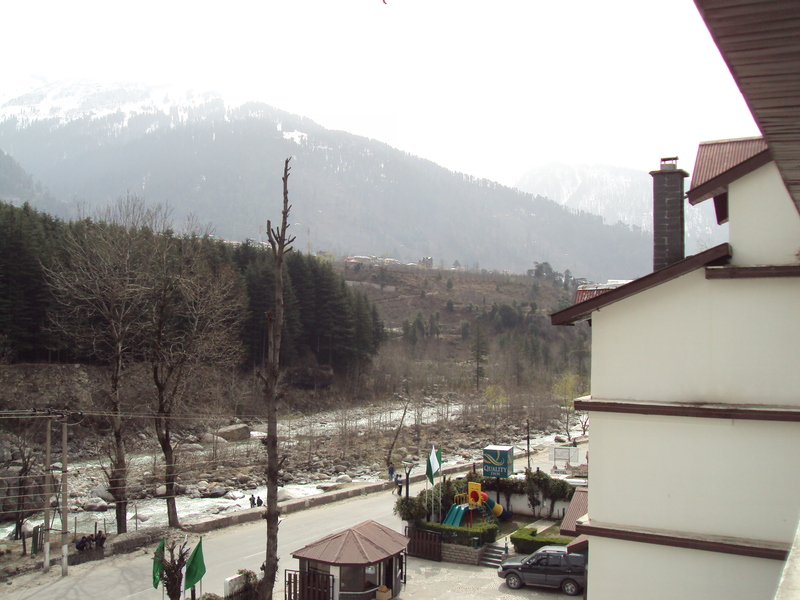 In Manali it is exactly that . 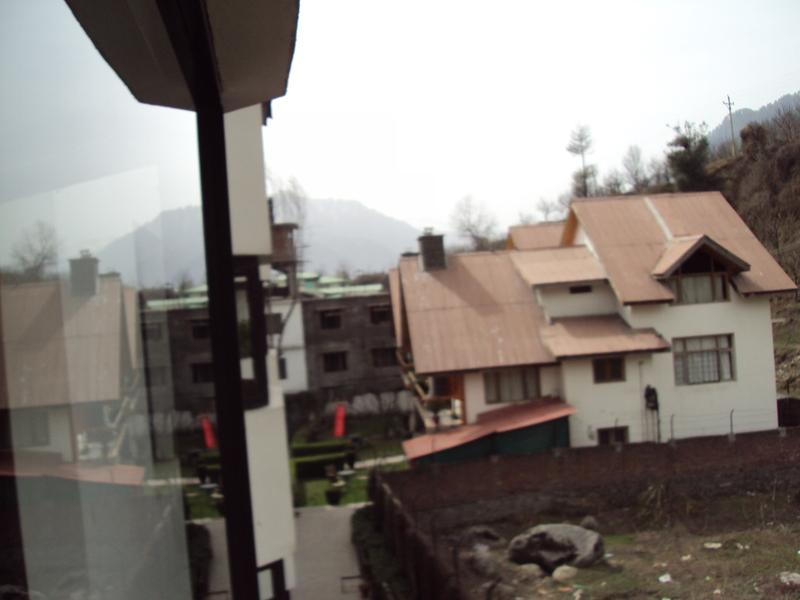 When you look up from the window , you can see snow – capped mountains a little far away . From the window of Quality Inn River Country Resort river Bias and snow – capped mountains seem within your reach , near your vicinity . It looked as if you could stretch your hand and touch them . Scene at the rear of the hotel was also breath – taking . 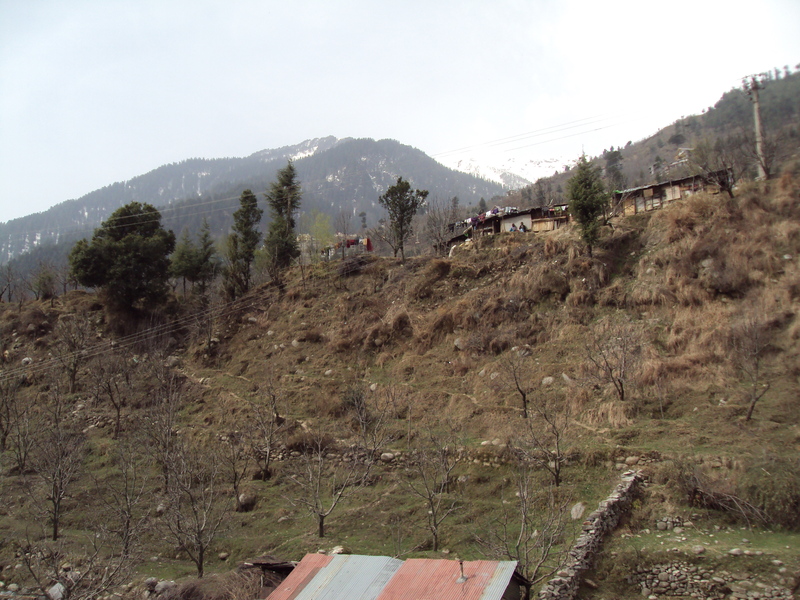 Mountains , gushing winds and beautiful cottages dot the compound of the hotel . It would have been nice to stay in a cottage but the tariff was on the higher side . After Hotel Golden Tower of Chennai , I found another hotel , where the travel desk is managed very efficiently . 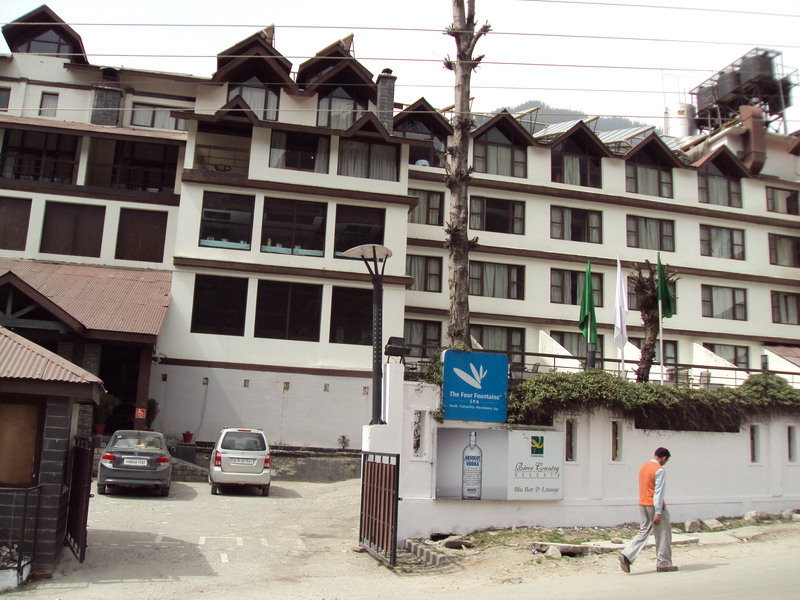 Courteous staff , ready to help manager and efficient people managing front desk make your stay pleasant . Since it is a 3 Star property , tariff is on the higher side but since breakfast and dinner is included in the package , I think it becomes affordable and manageable for middle class tourists also . It’s only drawback is 2 km. long distance from the Mall , the market . Since finding a rickshaw is difficult , you have to walk to the market . And if you are a shopaholic or a die – hard wanderer like me , it becomes quite tasking to walk to the Mall throughout the day . Apart from its distance from the main market place , I found no negative points in this 3 Star property . Lack of internet is another deterrent but it is not confined to this hotel alone . 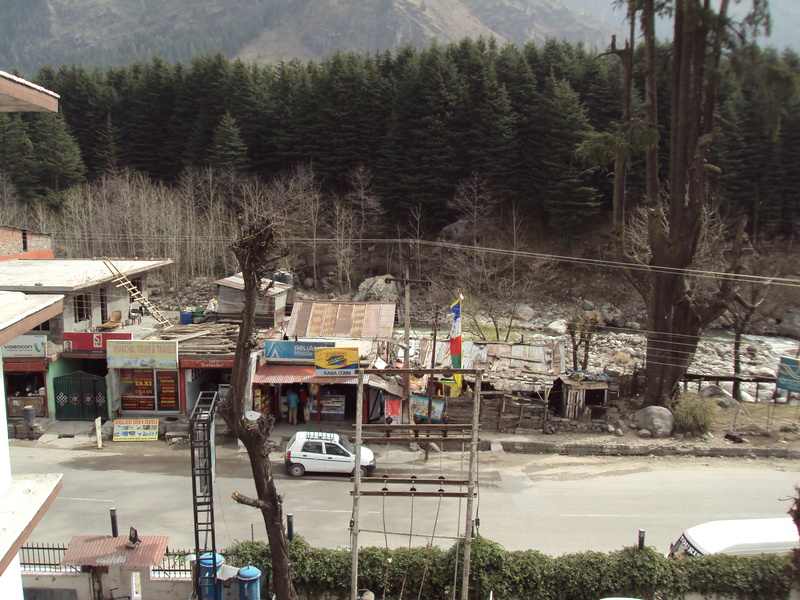 It is a problem you will face everywhere in Manali . Barring BSNL every other internet service provider fails in Manali . 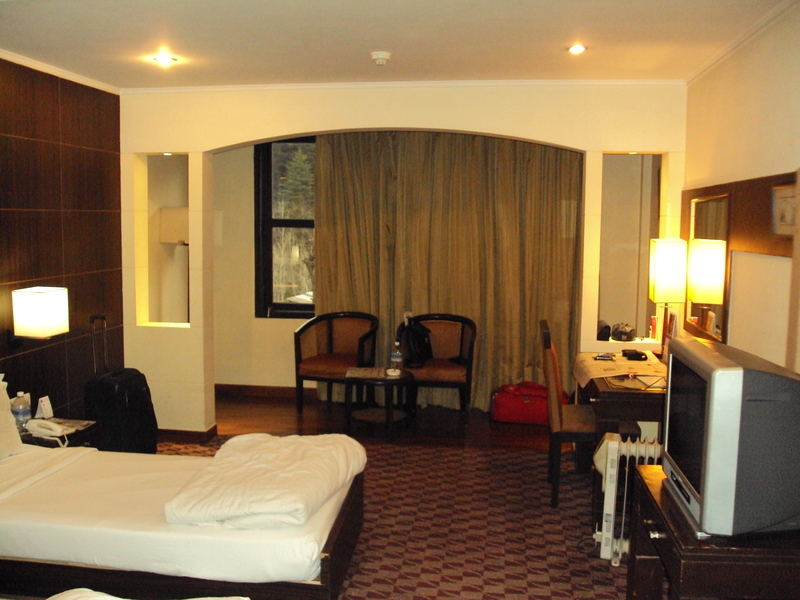 If you want a comfortable stay in Manali within affordable budget and just one deterrent , I highly recommend this property. According to me Quality Inn River Country Resort deserves 4 and 1/2 stars out of 5 . In Memoriam Rajesh Khanna : Zindagi Kaisi Hai Paheli , Hai! 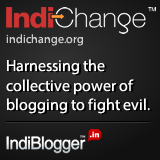 MUMBAI – MAHARASHTRA – INDIA JULY 24 , 2012 01.15 A.M.
Dara Singh died on July 12 , 2012 . 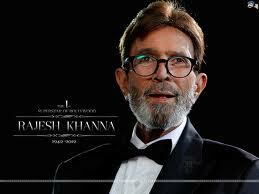 Within a week another luminary of the Hindi film industry bid adieu to this world . 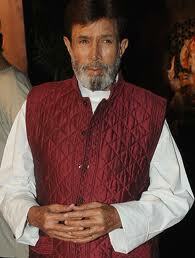 Rajesh Khanna died on July 18 , 2012 . Let me state honestly . I am not his fan . 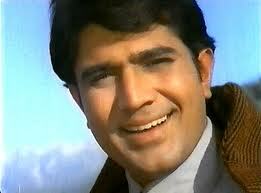 In fact I was never ever a fan or admirer of Rajesh Khanna , the actor or the man . Though I have watched many of his films . I do admire some of his cult films . I definitely remember and hummed many of his iconic songs . I am very much aware of his stupendous super stardom , which , once upon a time , engulfed the film industry like a hurricane or tornado or tsunami . I am witness to those years when every star was dwarfed in front of him . I am well aware of those momentous days when everyone or everything became insignificant in his presence . His blitzkrieg darkened all the other objects . His tumultuous rise momentarily eclipsed all the other stars and consigned some of the mightiest stars into the trash bin of history . I am witness to those days . I was living in that era . I am privy to those happenings . 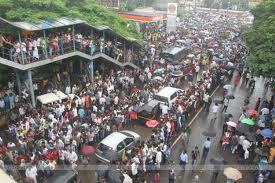 In 1972 I was here in Bombay [ now Mumbai ] . 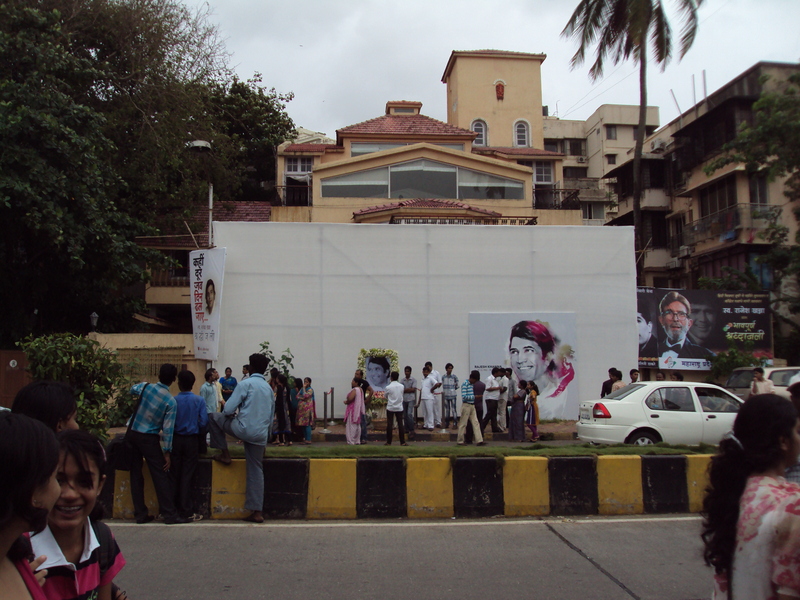 I have seen the crowd in front of his bungalow Aashirwaad . I have witnessed the fan adulation . But still , I was not his fan or admirer . But I was saddened beyond words when I heard the news of his demise . 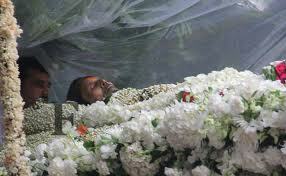 My wife , again not his fan , cried profusely when she watched his funeral procession . So the question arises , what happened to us ? 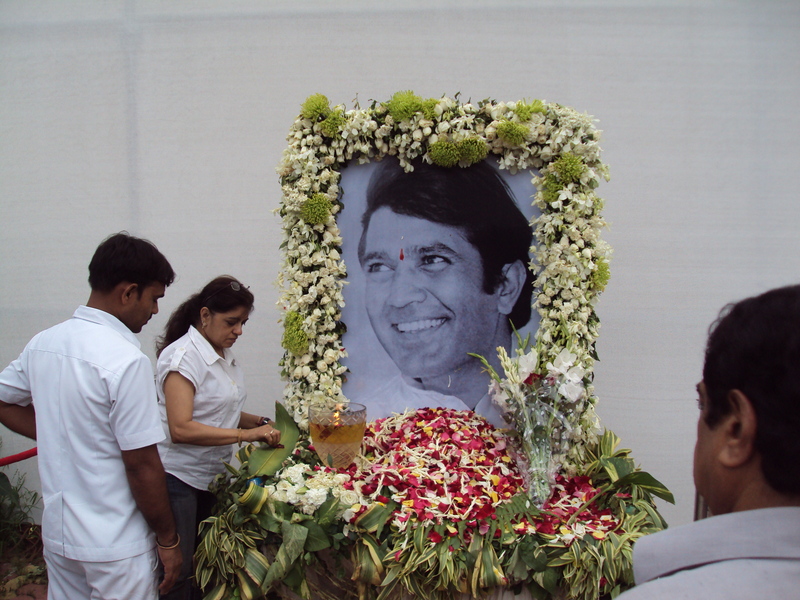 Why we felt for Rajesh Khanna so deeply ? Is it not enigmatic ? Is it not ironical ? No , it is not . Just watch these pictures posted below and notice the horrific changes in his personality down the years and you will fully understand the reason of our empathy . From a dashing , charming young superstar to a pale shadow of his own self , these photos tell us a very tragic and pathetic story . 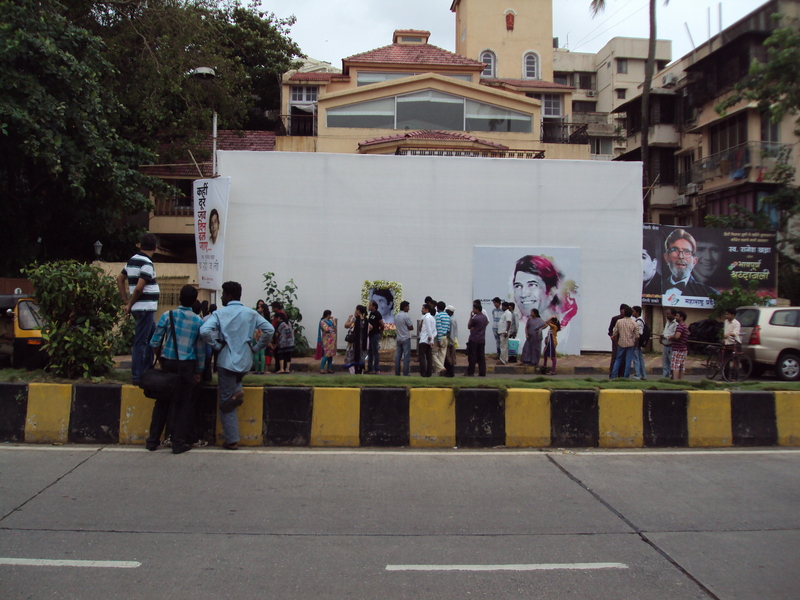 For present day generation of movie – goers , his popularity during his heydays is unknown and unimaginable . I am presenting some of the milestones of his life’s journey one by one . 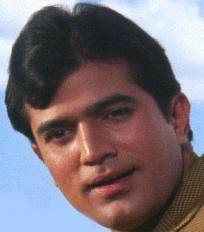 1966 : Made debut with ” Aakhri Khat ” . 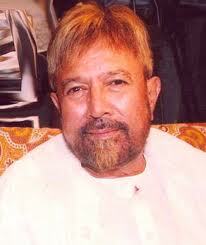 1967 : Made his mark with ” Raaz ” . Within 3 years of making his debut , he attained unimaginable , unheard of and unprecedented super stardom in 1969 with ” Aradhana “ and gave 15 consecutive super hits till 1972 , a record still unbroken . ” Daag ” [ 1973 ] and ” Namak Haraam ” [ 1973 ] were also big hits . But 1973 was a watershed moment in his career . He was eclipsed by Amitabh Bachchan in ” Namak Haraam “ . Amitabh Bachchan’s career defining film ” Zanjeer “ also came in 1973 . 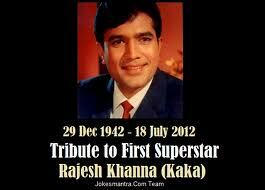 And thus began the well – known downward slide of mighty Super Star Rajesh Khanna . Alarmed by his waning popularity , he married much younger Dimple Kapadia and made headlines temporarily. 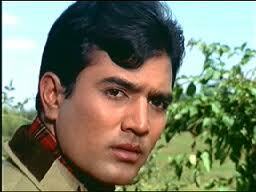 Though in 1974 he gave 2 super hits like ; ” Aap Ki Kasam ” and ” Roti “ but the slide was visible and evident . The era now clearly belonged to Amitabh Bachchan , who once played second fiddle to him in super hit , iconic cult films like ; ” Anand ” and ” Namak Haraam ” . Poster of these two films can give you Amitabh Bachchan’s position in the industry in those days vis-a-vis Rajesh Khanna . But alas , the cruel hands of fate had started writing some unknown and inglorious chapters of his life with indelible ink . In 1975 Amitabh Bachchan gave ” Deewar ” and ” Sholay ” . Rajesh Khanna’s mentor and lucky mascot Shakti Samanta made ” Mehbooba ” [ 1975 ] . ” Deewar ” and ” Sholay “ were super hits and became ageless cult classics . While ” Mehbooba “ was a resounding flop and sealed Rajesh Khanna’s fate finally. After 8 years gap and some insignificant films in between , in 1983 , he again came with 2 mega hits like ; ” Avatar ” and ” Soutan “ but the magic was missing . Even these massive hits could not salvage his lost position in the industry . His turbulent career affected his personal life also . 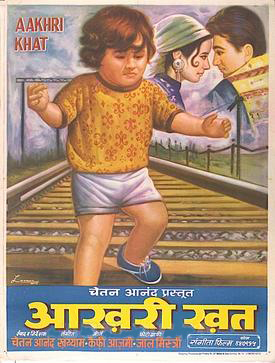 In 1984 came the tragic separation from Dimple Kapadia . From 1983 [ his last hits ] to 2012 [ his death ] , 29 years of his eventless , colourless career and lonely personal life proved fatal for him . 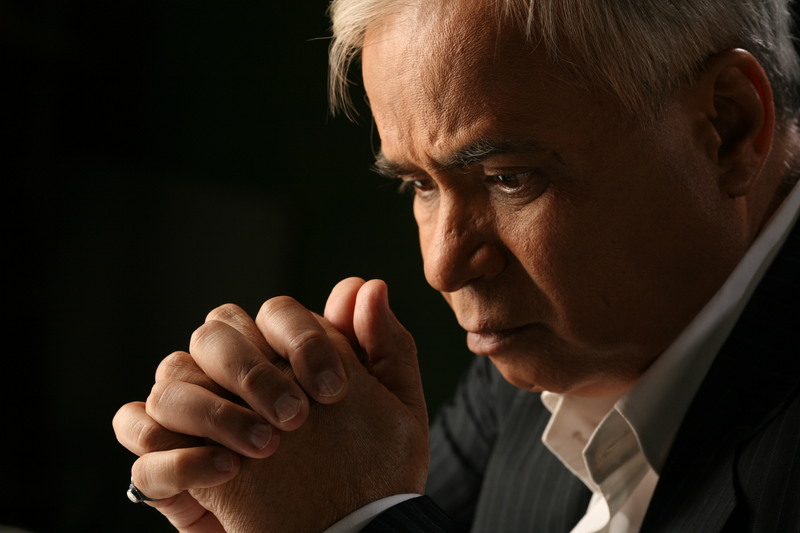 It is regrettable and cruel irony that a c-grade movie ” Wafaa ” [ 2010 ] is his last film . In between he dabbled in TV also . In total he worked in 4 TV serials . ” Apne Paraye [ B4U TV – 2001 ] , ” Ittefaq ” [ Zee TV – 2002 ] , ” Bhabhima ” [ 2008 ] and ” Raghukul Reet Sada Chali Aayi ” [ DD 1 – 2008 ] . 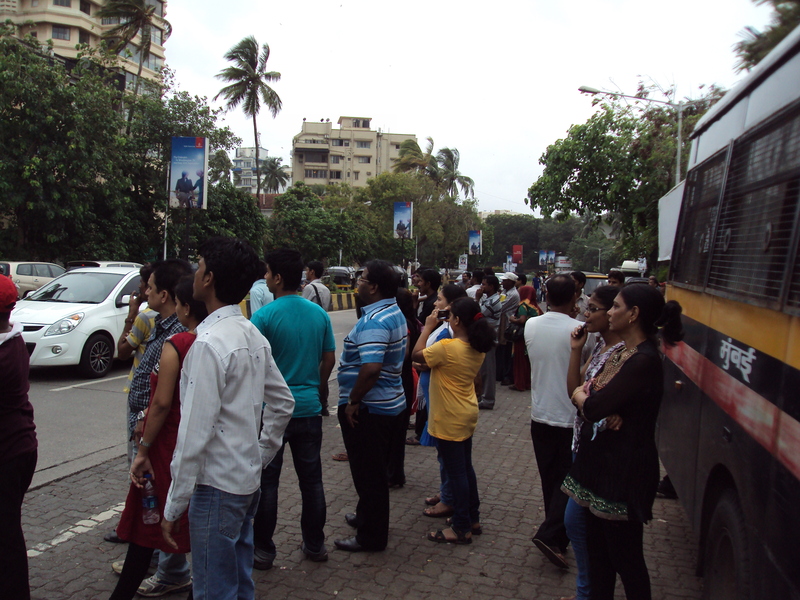 But none could touch the popularity of Amitabh Bachchan’s ” Kaun Banega Crorepati ” [ Star Plus – 2000] . It is sad . It is heart – wrenching . People say many things about him . I , myself know many stories about him , which are said to be the cause of his downfall . But I don’t want to write those stories after his death . After all he was human and to err is human . Just re – think about some facts of his life . He debuted when he was 24 . He attained superstardom when he was 27 and lost his empire when he was just 31 . After that , till his death , it was 38 year – long wait for regaining his lost empire . It was 38 year – long wait for The Knock at his door by any producer or director . 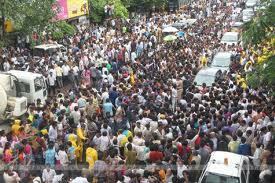 It was 38 year – long wait for the crowd to assemble again at his doorstep . It was 38 year – long wait for the same mass – hysteria , same mass adulation which was once his right and he thought it was his birth right . Mass hysteria , mass adulation did happen again but alas , it happened only after his death . See these pictures of his funeral procession and then watch the crowd in front of his bungalow Aashirwaad and you will be able to feel the irony of fate . I wish , this attention should have happened a year before ……….. or a week before ……… or even a day before ………… he would have died a happy and contented man . But strange are the ways of destiny. I agree , he did make some mistakes . He did err like a human and for that mistake , for that error destiny punished him with all its might , with all its ferocity , with all its lethal cruelty . He , for his mistakes , never got same benevolence by destiny , which others easily got for their sins . Fate was condescending to others , not to him . He was like quintessential Greek tragic hero . You can only feel sorry for him . You can empathise with him . And you could hum his memorable song …. zindagi kaisi hai paheli , hai ; kabhi ye hasaye , kabhi ye rulaye ……. Ek din sapno ka rahi , chala jaye sapno se aage kahan ……….. 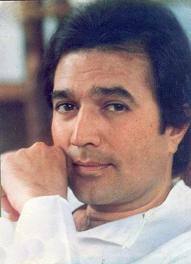 Phenomenon , known as Rajesh Khanna , regained some of his glory once again but alas , only after his death . He had gone forever and had gone even beyond his dreams . 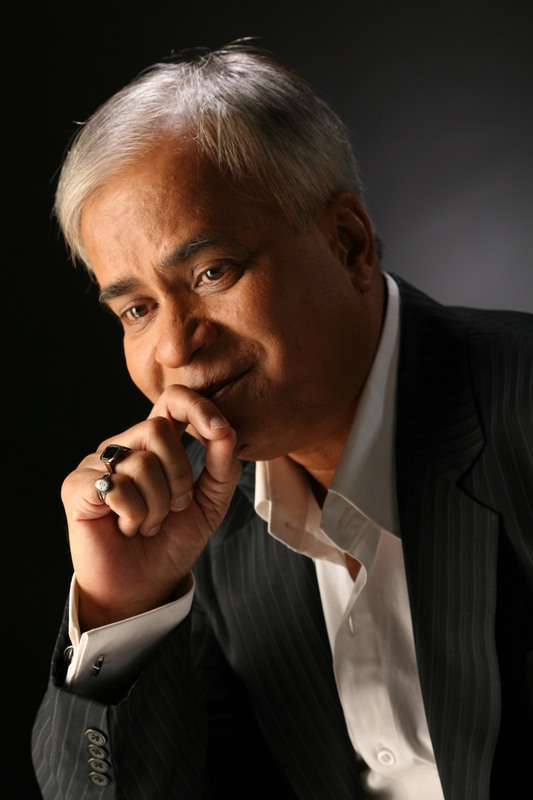 As I finish my blog , I feel , I must express my admiration and gratitude to his son in law Akshay Kumar and his long – time friend Anju Mahendru , who took every care to give him comfort during his last days . Though it seems futile , but still , it was because of them that a befitting funeral could be arranged for this forgotten phenomenon , fallen Super Star and a lonely icon , who once ruled supreme . 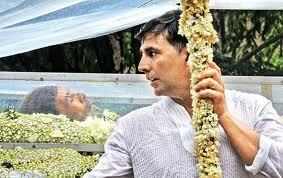 Thank you Mr. Akshay Kumar , thank you Madam Anju Mahendru , I bow my head in gratitude ! May God bless you two ! My heart also goes for Rinke Khanna , my student , who was very close and was very much attached to her father . If I could feel so much without being his fan or admirer , then you can imagine the pain and pathos of his fans and near and dear ones . Rest In Peace Sir ! Destiny was cruel to you . Better luck in next life .